Mark Waller started BridgeWorks Capital in 1985. BridgeWorks is a middle market private merchant bank which starts and supports companies involved in clean energy, software, medical devices, natural resources and agriculture. Mark served as a Founder, Director and Chairman of GE/PrimeStar, the General Electric Company’s solar panel manufacturing business from 2009-2011. Mark currently serves on the Boards of Self-Enhancement Inc, Portland Habitat for Humanity, Maitripa College, Lake Oswego Rotary, Hunger Fighters and Storion Energy. Past Board service includes Friends of the Columbia Gorge, the National University for Natural Medicine, the Oregon Environmental Council and Clackamas Women’s Services. Mark co-hosted President Barack Obama’s first visit to Oregon in May, 2008 and worked with a national group of cleantech financiers and executives to help craft the first Obama’s Administration’s cleantech priorities. 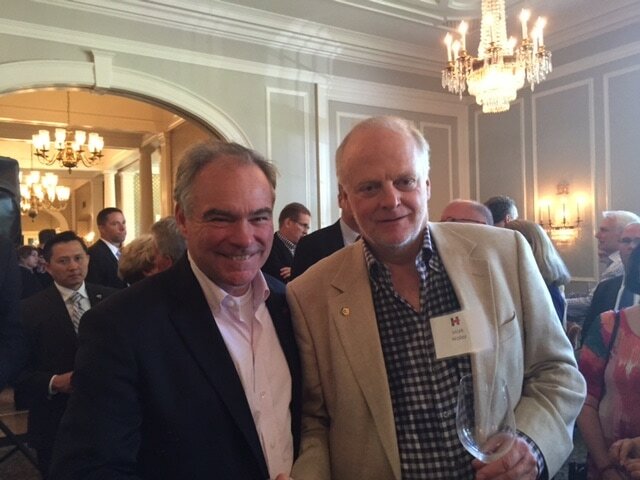 Mark, right, with Senator Tim Kaine.